Vine Disposal, LLC is a family owned and operated Roll-off Container Rental Company. We are widely recognized for the commitment to customer service. 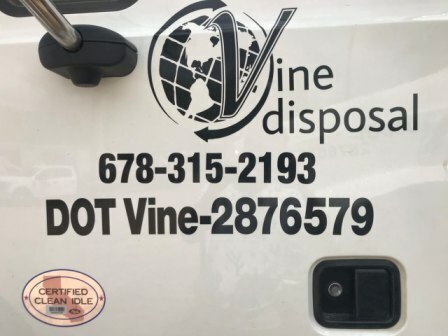 At Vine Disposal we take pride in the fact that it maintains one of the highest levels of customer satisfaction in the Atlanta metro area and surrounding counties. Our services include, but are not limited to providing dumpsters to commercial, private household, industrial and all other contractors. If you plan a project or need to clean out any part of your home or business, give us a call and we will be happy to assist and guide you through the process from delivery to pick up. In today’s waste industry, which is largely dominated by publicly owned entities, Vine Disposal LLC is proud to state it is still family owned and operated. We know you have a choice of roll-off rental companies and we appreciate your consideration. Our hope is that you will feel confident in our extensive experience and knowledge of the waste industry and our ability to meet and exceed your expectations. If you have any questions, want to get a quote, or schedule a delivery, call us at 678-315-2193.